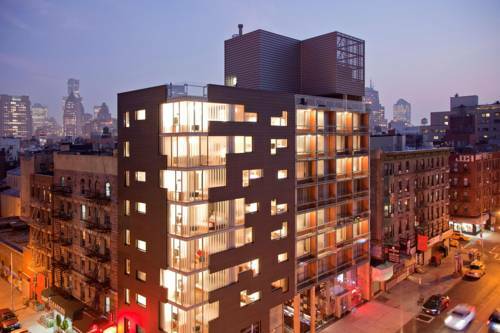 Located in the heart of nolita the luxury nine story glass structure is located on the corner of kenmare and elizabeth streets and offers 55 non-smoking guest rooms award winning dining and private rooftop. Our boutique accommodations suggest an artful juxtaposition that balances the beauty of natural elements with state of the art technologies. From the hardwood oak floors to the luxury rich walnut and corian accented open style bathrooms you will have all the comforts of home and service that is personally yours. Our downtown neighborhood offers a rare view of the character and charm that has shaped new york city. From houston to broome from lafayette to the bowery and all the streets in between - come explore nolita with us. From the historic architecture of st. Patricks old cathedral to the enticing offerings at calypso john fluevog and ralph lauren from the lunch trucks to the sidewalk table at cafe gitane to the dining rooms at bread and peasant - nolita has something for everyone. Come experience one of new yorks most authentic and endearing neighborhoods. The nolitan hotel is centrally located in downtown manhattan and is walking distance to many other new york landmark neighborhoods such as soho tribeca little italy chinatown greenwich village east village the bowery and new york citys lower east side. From the nolitan hotel you can easily navigate to wall streets financial district the times square theater district central park or midtown manhattan. The national september 11 memorial museum will open as the countrys principal institution concerned with exploring the implications of the events of 9/11 documenting the impact of those events and exploring 9/11s continuing significance. The park consists of 250 acres of lawns 24000 trees 150 acres of lakes and streams and 130 acres of woodlands install hundreds of thousands of plantings annually including bulbs shrubs flowers and trees maintain 9000 benches 26 ballfields. Get skyward and discover what the city looks like when you are 1050 feet 320 meters high at the top of New Yorks most iconic skyscraper. The 86th floor observatory with its popular 360-degree outdoor deck also has indoor viewing galleries for guest. Largely centered around mulberry street little italy represents new yorks italian heritage that dates back to the 1880s. Restaurants cafes and gourmet food shops populate mulberry street. Newly opened torrisi italian specialties. From the soaring views of top of the rock to a backstage pass at NBC studios every tour at rockefeller center brings you inside and behind-the-scenes of some of the citys most beloved treasures. Once home to new yorks artists and avant-garde set soho is now new york citys premier boutique shopping destination. Soho sits just south of houston street and is a short walk from the nolitan hotel. Liberty enlightening the world the statue of liberty enlightening the world was a gift of friendship from the people of france to the people of the united states and is a universal symbol of freedom and democracy. Manhattannew york museum which exhibits new work by american and international artists with an emphasis on innovation in a variety of media. Times square is a major commercial intersection in midtown manhattan new york city usa at the junction of broadway and seventh avenue and stretching from west 42nd to west 47th streets. Times square iconified as the crossroads of the world. Centered on the eight-block-long street running from broadway to south street on the east river in lower manhattan. It is the home of the new york stock exchange the worlds largest stock exchange by market capitalization of its listed companies.